Digital Powerhouse Secrets - Master Resale Rights Included! Digital Product Creation Strategies - Master Resale Rights Included! 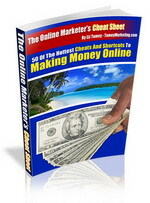 *brand New* The Online Marketers Cheat Sheet - 50 Hot Cheats And Shortucts To Making Money Online !master Resale Rights Included.